Fact: The 2019 Denver Nuggets are better than the 2019 San Antonio Spurs. The standings say so. Charles Barkley has said so. The eye test says so, too. Fact: History does not say so. The San Antonio Spurs have owned the Nuggets for the better part of two decades. Over the course of the rivalry, the Spurs own a regular season record of 118-69 over the Nuggets. In the playoffs it’s worse – 20-6. Four of the Nuggets six playoff wins over the Spurs occurred prior to 1985. 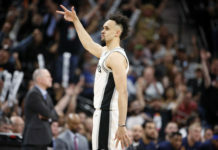 In the Carmelo Anthony Era – or more aptly, the Tim Duncan/Tony Parker/Manu Ginobili Era – the two teams met twice in the playoffs (both in the first round); San Antonio won both series 4-1 and went on to win an NBA title (2005, 2007). That’s the question. Can these Nuggets beat the ghosts of the past, much less the Spurs? The past says the Nuggets are a perennial first round out. The past says that Gregg Popovich, the Spurs venerable coach, has Denver’s number – regardless of standings or the results of the season’s head-to-head matchup (2-2, for the record). 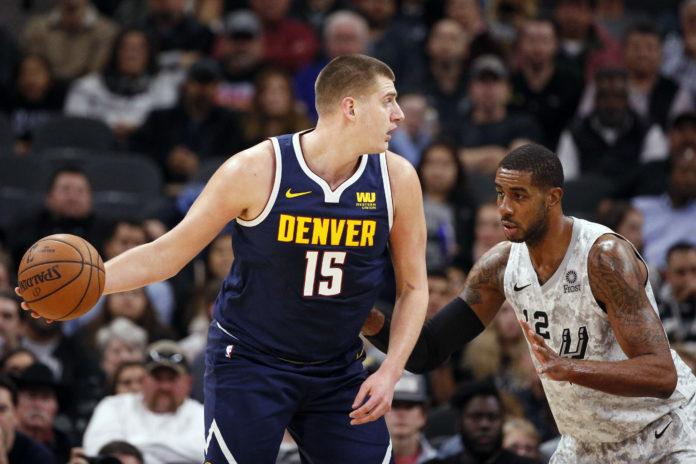 Does Pop fear analytical anomaly Nikola Jokic as much as the numbers suggest he should? 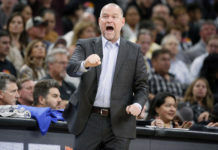 Pop says that Nuggets coach Michael Malone should be the NBA’s Coach of the Year; but is the up-and-coming Malone good enough to beat a legend even if San Antonio’s roster is inferior? Can Denver, the No. 2 seed in the gauntlet that is the Western Conference, overcome a flimsy finish to the season? 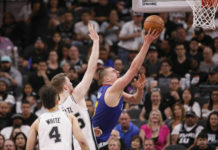 The real question: Can the Nuggets dismiss the reputation that belongs to both the Spurs and themselves? Looking for some help from history? Here’s a nugget for you (call it a three-piece chicken tender): The last and only time the Nuggets have beaten San Antonio in a playoff series, back in 1985, Denver had the homecourt advantage (the only time ever in the history of the teams matching up in the playoffs). The last and only time the Nuggets have beaten the Spurs in the playoffs, Denver was the No. 2 seed, and San Antonio was No. 7. The last and only time Denver won a playoff series against the Spurs, the Nuggets game one. Two of those three things are already in the bag. Makes Saturday night’s game pretty important, doesn’t it? Win the game, win the series. Oddly, that didn’t work the last two times these two met. Denver won the opening game both times; the only problem is that both of those wins came on the road. Now the Nuggets have homecourt advantage. Another (key) fact: History is, well, history. It’s irrelevant. It doesn’t matter. Smart teams and coaches fuhhgettabbouuutit. Sports are a “what have you done for me lately?” kind of business. This is not one of better Spurs team of the past two decades. Even Popovich would tell you that. Tim Duncan is not walking through any door. Tony Parker is not… Manu… you get the idea. LaMarcus Aldridge will be. DeMar DeRozen will be. Derrick White will be. Sound familiar? The Nuggets are young and exciting. When they work hard on the defensive end, they generally win. They’re vastly improved from a year ago, when they narrowly missed the postseason. But can they win this series? Of course they can. Denver is the better team. They’ll just have to beat a few ghosts along the way.